​Practice "Three Step Stop" because: Teaching your horse to give to the bit while keeping its body straight is critical for a good stop. That's what this exercise will teach your horse. It is mandatory for those looking to put a good solid foundation on any horse. Wouldn't it be cool if your horse would stop on a dime? (Or stop at all?) Wouldn't it be great if it were more willing and maneuverable? And doesn't it just make you crazy when it throws its head up when you ask for more speed or drops its shoulder as it blows into a lead...? You need to perfect an exercise called "Three Step Stop." "Three Step Stop" will remedy those situations described above. It'll make your horse stop now as opposed to later; it'll make your horse more maneuverable and smoother through its transitions (slow jog to extended trot, trot to lope, etc.) and it goes a long way towards building better manners and picking up the correct lead. Most importantly, it teaches your horse that when you ask for more speed and drop your legs against its sides, it's to put it's head down, "collect up" and move fluidly - not throw its head up in the air and drop a shoulder as it lurches forward. You've seen this many times: The faster you go, the higher the head gets. You add speed and with speed comes emotion. This exercise teaches your horse a cue: When you bump with your legs, it should bring its head down. And, more than that, anytime you touch the reins, the horse should know to "get into frame," that is, to carry itself in a correct, collected position. There are three parts to this exercise called "Flying Time," "Take Off" and "Landing." "Landing" is stopping the horse (from a walk), then bumping with your legs, asking the horse to soften (or relax) it's neck muscles and drop it's nose. You don't want to go forward, (or to move at all, for that matter) just for the horse to soften up and "give to the bit." A "Take Off" is when I've got the horse softened up or in the frame I want and I ask him to step forward. I ask him to move forward and into the bit. "Flying Time" is when the horse is actually giving and traveling at the same time. From our Ask A Horse Trainer free article series: Get better stops, smoother transitions and a more willing horse with this easy exercise called Three-Step-Stop. Also, fix horses that root at the bit. At first the horse may only lower its head before they soften. That's okay. Release on the horse lowering its head - and just keep building on that. It cannot be stated often enough: Horse training is about building on small changes. (Don't start with your goal.) If your horse begins to whip his head back into position like a snapped rubber band, (it'll feel like he's being rude, throwing his head up or done rapidly), just play with your timing. Try releasing a bit slower, try holding till you think the horse is being "polite" with his give, then release. Don't let them walk forward; hold them back. You may have to really motivate them to drop that head with your legs by squeezing or kicking. The first time you do this, look for something small, a small change or give. Build on it. Take any downward motion at first. Squeeze and when the head just begins to go down, release. You'll find that some horses will simply walk out after you release; others will simply stand there. Whether your horse walks out on its own or you ask it to walk out, doesn't really matter. Either way, you'll simply go three steps then stop the horse, repeating the exercise. The important thing is simply that you do this every three steps. If your horse begins to back up (or creep backwards) slowly, then use your legs and seat to drive them forward. But, if your horse really wants to back up, then take the opposite approach. Instead of driving them forward, let them back up until they quit backing. They'll usually back up 10 or 15 feet, stop, then soften up. You'll let go and repeat the exercise. Remember, throughout this (or any) exercise, look for something to release on and then built on it. Don't go for the big picture when you first begin. Release on something small. It will build very quickly. What's happening is that the horse is being driven forward - but the whole time you're holding the front of the horse in place with the bit and your two hands. As the back legs come closer to the front, but the front stays blocked by the bit, the horse's back comes up. It'll feel like your saddle raises several inches. Release the horse and let it walk back out. Third Step: At first you released when the horse softens his neck muscles. As your horse progressed, you released when the back feet come closer to the front. Finally, you want to work on building the horse's strength and ability to hold this collected position for longer periods of time. Remember: It's difficult for a horse that isn't used to working his muscles in this way to carry himself in frame for more than a few seconds when you first begin. It will take weeks if not months for your horse to build up the strength. In the meantime, as you practice (and your horse develops his muscles), your horse will also be learning that there is a correct frame, or correct way to carry himself when being ridden. You can continue this exercise through the walk, then the trot - and into your lope. If you're working on your reining stop, for instance, you'll pick up your reins, drive your horse into the bit and use what you've learned here to really get that inside hindquarter way up, closer to the front of the horse. So then, when you've mastered this exercise, the cool "upshot" is that if you're riding your horse, and his body is in the wrong position to pick up his lead, for instance, (maybe he's all "splayed out") then you can simply pick up the reins and drive him forward without picking up speed. He'll stay relaxed and soft; he'll willingly "assume the position" you need for your next maneuver. You'll just push energy into him to soften up his nose up and into position, to where it's supposed to be, working to get his nose and hip into position, then release and just lope off. Be careful during your transition to ask the horse to stay soft, to not push on the bit - and to not pick up speed, but rather to just lope off. ​Tip: If your horse needs training... what do you do first? Find out! Download a free sample of "What I'd Teach Your Horse when you click here to get more info. If you ask your horse to stop (again, with two reins) and it stops with it's head thrust out, just let it stop with its head out. (Remember: If your horse is doing this, fine - that's exactly why we're practicing this exercise. Your horse needs help on its "Landings.") Your training doesn't change: Drive her forward with your legs into the bit, releasing when she drops her head or softens her neck muscles. Same goes for the horse that wants to throw its hips or shoulders out of position, as we've previously discussed. Practicing your "Flying Time" is very important. (That's the part where your horse is soft and moving forward at the same time.) Doing this teaches your horse to give to the bit, to stay soft - and to stay in position, collected or "in frame." If you look down at your horse when you first begin this exercise, what you'll see is the head "way down there" with the tail and back legs "way back there." But you want your horse to be round - like you're riding a giant ball and you're the pivot point of this big ball. You want to roll the ball to the right or roll the ball to left. That's the point of this exercise, to turn your horse into a giant ball. That's what you should be thinking about as the two of you advance and you're looking for your release. Next Step: When the horse will willingly soften his neck as described, then your next step is to get the hindquarters to "engage" a little more. Think of a horse that won't get into a trailer. They'll lock their feet up at the entrance to the trailer - and simply creep their back feet closer and closer to the front. That's an exaggerated view of what you'll be looking for and seeing here. Another good analogy: Picture a brick wall right in front of you. (The brick wall, or barrier, is created by your two hands holding the bit.) What you want to do is push them right up into that wall by really squeezing with your two legs. When the horse moves up and softens, you let go. If a car were to smash into that wall, the middle part would bulge up, right? Same thing with your horse: Begin to feel for the horse's back to come up. When we first teach the exercise we'll simply work to get the horse to drop his head and soften his neck muscles, releasing when he does. As the horse improves, you want to begin to ask for more. At that point you'll watch the back feet and release when you notice them getting (incrementally) closer to the front feet. How You'll Accomplish This: Walk forward three steps, stop, drive your horse into the bit with your legs (by bumping) until they soften their nose up, then release and walk out. Begin by walking your horse forward. 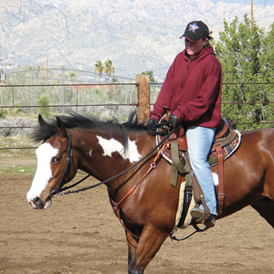 Count off three steps and ask your horse to stop by picking up both reins and applying pressure. Continue to drive forward with your seat and bump with your legs - but don't let the horse go anywhere. Hold steady, even pressure until you feel the horse's neck muscles relax. Release (by putting slack in the reins) and move forward exactly three steps. Stop and repeat: Pick up both reins, drive with your seat and legs till you feel the nose start to soften up then release. Do your best to hold your horse straight through this exercise. That is, don't allow them to swing their hips or shoulders off to one side or the other. If the horse moves off to the left or right or begins sidestepping, use your rein to correct him. For instance, if your horse starts moving off to the left, pick up the left rein and find the angle and/or amount of pressure it takes to make the horse stand squarely, with its hips directly behind its shoulders. Don't make a big production out of this. In many clinics we see people working harder to make their horse stand still than they should have to. Do the best you can to get your horse squared up - but your concentration should remain on getting the horse to soften up when you pick up the reins. The "dancing around" will go away as the horse begins to realize that all you want is for them to soften their neck muscles for a moment.